Just across the street from Fairfax’s grassy town park and weekly farmers market sits the modern wine bar and restaurant, 123 Bolinas. 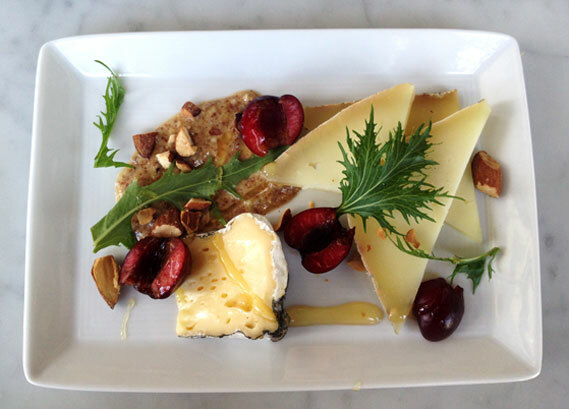 A definite player in the slow food movement, 123 Bolinas has everything from seasonal organic veggies to sustainable wines and close ties with farmers in the region. The intimate restaurant feels upscale at first glance, but it’s relaxed inside. The pretty interior lighting, reclaimed wood furniture, and large windows overlooking the nearby park make for one of the best restaurant atmospheres in town. 123 Bolinas doesn’t specifically cater to celiacs, but the waiters are knowledgable about every ingredient and will even have the kitchen whip up something special if the menu that night doesn’t suit your dietary needs. 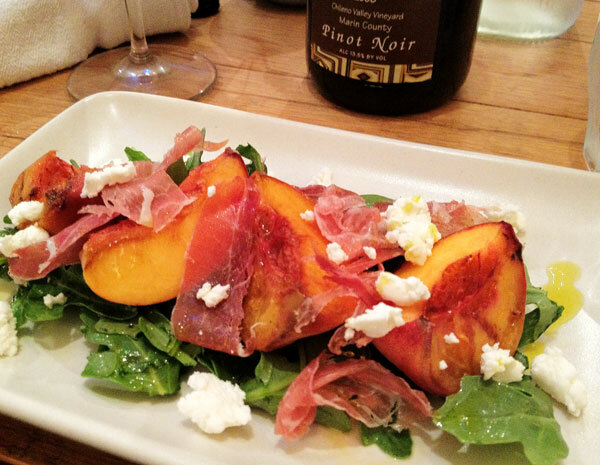 Check the chalkboard for seasonal small plates like grilled peaches, chevre and procuitto served over rocket greens, or order something more substantial like the pan seared rock cod with summer stew, turnip, and sweet peas. There can never be too many peaches in my kitchen during July and August. I’d say about a quarter of the cash I bring to the farmer’s market goes into the hands of the organic peach guy. Here’s a little something I threw together with a few of them this week. In a large bowl, whisk together dry ingredients (flours, sugar and salt). Chop cold butter on a cutting board and add to dry ingredients, incorporating it in with a pastry cutter or your hands until dough becomes more uniform and butter chunks are no larger than the size of peas. Form a well in the mixture, crack the egg inside and drizzle in the cider vinegar. Stir clockwise with a fork starting in the center and working your way out, mixing until dough forms a soft ball (you may need to use your hands for this too). Place the ball in a layer of parchment paper and flatten it out a bit. Stick it in the fridge for 1 hr- overnight before rolling out. When ready to roll out: remove from fridge and let rest a few minutes. Flour the counter and your rolling pin. Carefully roll out crust and place into greased pie dish. Don’t feel bad if the crust doesn’t land in the pie dish in one piece (there’s no gluten gluing the thing together), sometimes it works beautifully, others it takes some piecing together once in the pie dish, result of finished pie will be exactly the same. 4 or 5 ripe organic peaches, sliced & chopped (some people like to peal their peaches, I prefer not to). Whisk flours, sugar, and cinnamon together and set aside. Combine chopped peaches and blueberries in large bowl, stir in dry ingredients. Pour into prepared pie crust. Combine dry ingredients, mix in melted butter and stir until crumbly texture is formed. Sprinkle over pie filling. 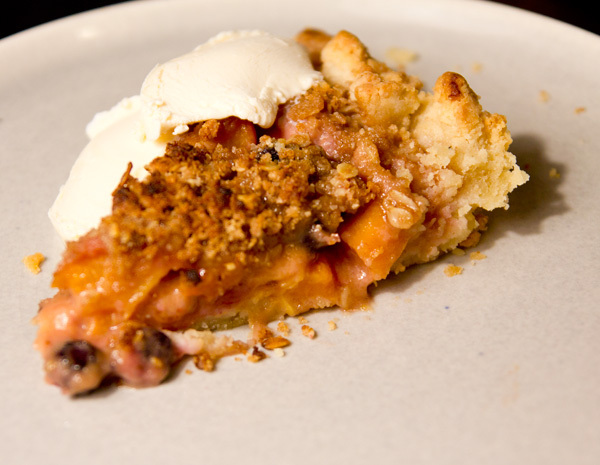 Preheat oven to 400 degrees and bake pie approximately 35-40 minutes (until peach filling bubbles up and crust browns). If crust or topping browns too quickly, cover with foil. Let cool a few minutes and serve with vanilla ice cream. Inspiration for new recipes can come from all sorts of places. A great dish at a restaurant, a photo on the cover of a magazine at the grocery store check-out, a borrowed cookbook. More often then not, it comes from scrolling through a favorite food blog, and gluten free recipes posted on non-gluten free blogs always catch my attention. It must be good if they’re willing to forego the protein that seems to make baking a whole lot more reliable and successful. What an unusual occasion it is when I don’t have to substitute one flour for another and hope for the best. 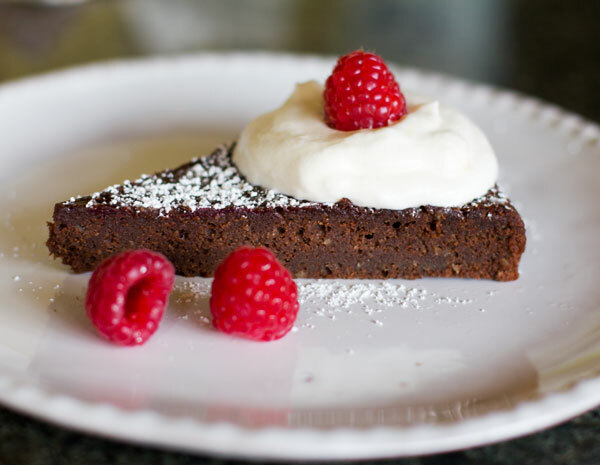 The recipe for chocolate buckwheat cake was posted by the talented Deb Perelman at Smitten Kitchen back in May. Equal parts almond meal and buckwheat flour produce a moist, delicate chocolate cake with a unique (but not too unique) flavor. This cake isn’t so rich you’ll have trouble standing up after you eat it, but it isn’t so healthy you’re still craving desert. Pair it with fresh whipped cream and a good cup of coffee for a european taste, or double the recipe, smother it in chocolate frosting, and stick candles in it for a birthday. Find the recipe here. 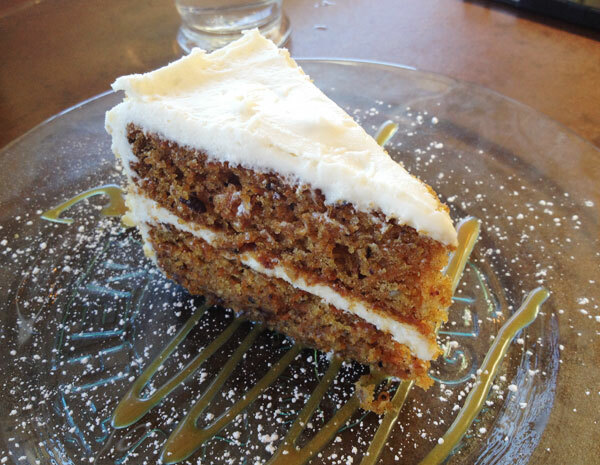 Coffee Bar in Truckee, CA might just be Tahoe’s best spot for gluten free foodies. 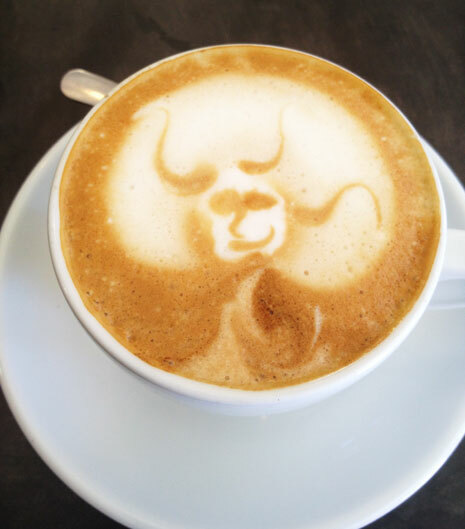 The italian inspired coffee shop is known for its high grade organic coffee and skilled latte art, but they also serve a number of fresh gluten free baked goods. 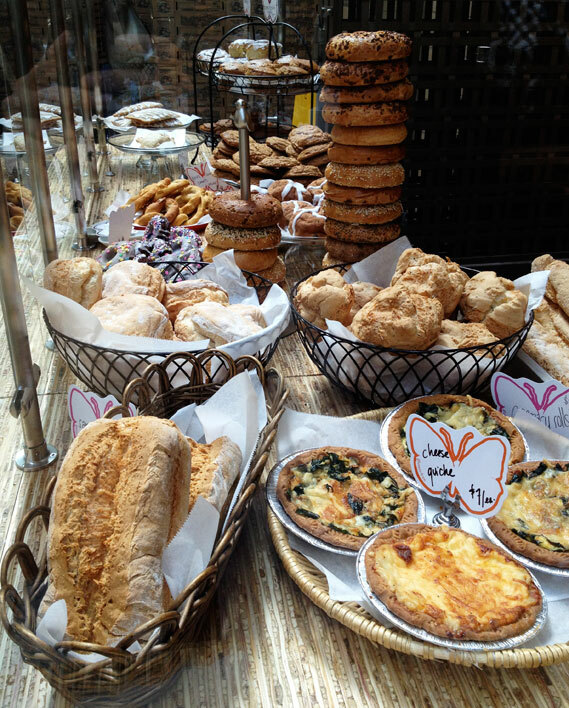 Quiches, big fresh muffins, and a variety of cupcakes are all made for Coffee Bar daily at a local gluten free bakery. You’ll also find fresh squeezed organic juices, smoothies, teas, and salads on the menu, most made with locally sourced ingredients. A less healthy but truly fantastic treat is the Marochinno, a cup of organic espresso lined in nutella with a scoop of gelato and a swirl of whipped cream. In the past couple of years, new restaurants have been popping up all over our neighborhood. What was once considered a no man’s land between Potrero Hill and the Mission is now an up and coming neighborhood dappled with numerous cool bars and acclaimed restaurants. Last night I stumbled upon the brand new Local’s Corner, a cafe just a couple blocks from my apartment. Not quite overflowing with customers yet, this three week old restaurant doesn’t know what’s coming. 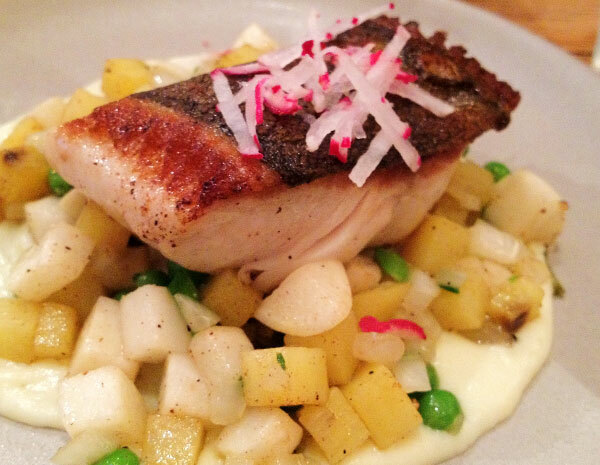 The menu at Local’s Corner is all about seafood, and appropriately the restaurant’s interior feels like a romantic little cafe in new england. Their cheese and vegetables are farm fresh and the seafood is sourced locally by fishermen committed to sustainability. Comprised mostly of sharable small plates, the menu lists dishes that feature dungeness crab, rock cod, cured halibut, king salmon, and bay or pacific northwest oysters. We tried four plates, and each one was exceptionally good. Our meal began with a beautiful cheese plate, then an arugula salad (ordered without croutons) tossed with garlic confit and topped with shaved capricious goat cheese, a dish worth more than every penny of the $8. Next we had the dungeness crab which was paired beautifully with delicate spring peas, cara cara oranges and roasted spring onion. 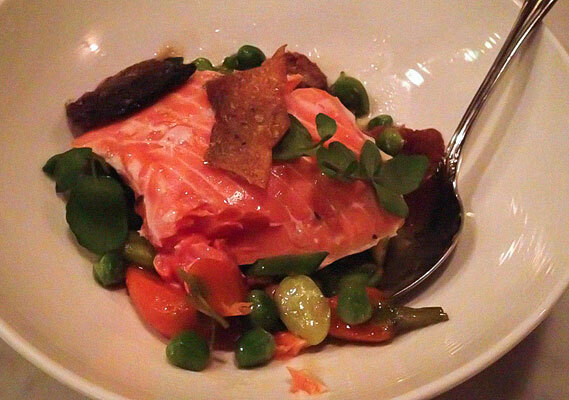 To follow were smoked trout rillettes topped with pickled shallot, and finally we had the king salmon served over fava beans and peas. Every dish we tried at Local’s Corner carefully brought out the best of each ingredient, highlighting delicate flavors in a way that made every bite taste impossibly perfect. 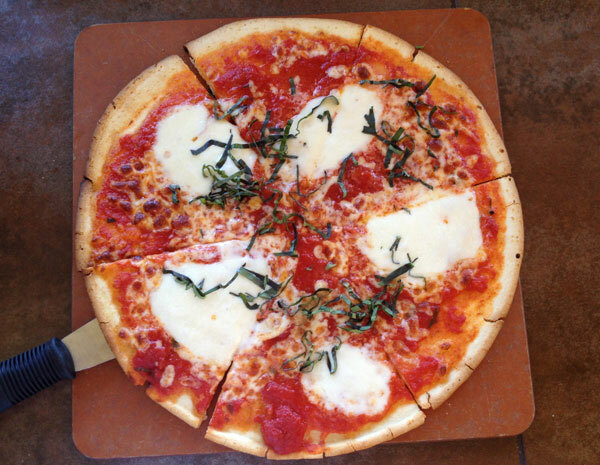 Most of the dishes at Local’s Corner are naturally gluten free, but check with your server before ordering. 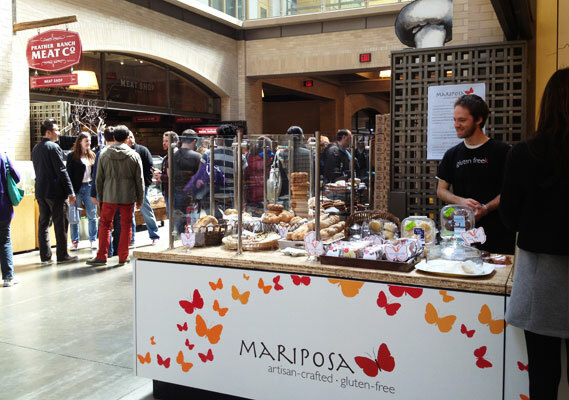 Mariposa’s brand new bakery in the Ferry Building opened just over a month ago. The 100% gluten free cafe expanded from a small kiosk offering a limited selection of their Oakland bakery’s treats into a full fledged gourmet gluten free bakery. With a wide variety of baked goods ranging from bagels and baguettes to apple tarts and donuts, Mariposa has every single craving covered. After oogling at their gorgeous spread and then selecting some fresh treats, pick up one of their classic frozen pizza crusts, ravioli, or gnocchi from the freezer. Mariposa’s Ferry Building Cafe serves both breakfast and lunch items like fresh sandwiches (egg salad, tuna, or veggie) and personal sized quiches. It’s rare to be able to grab a gluten free sandwich on the go, much less eat it looking over the beautiful bay and then finish it off with a fresh baked cookie. Mariposa’s new cafe is a real asset to the gluten free community of San Francisco.